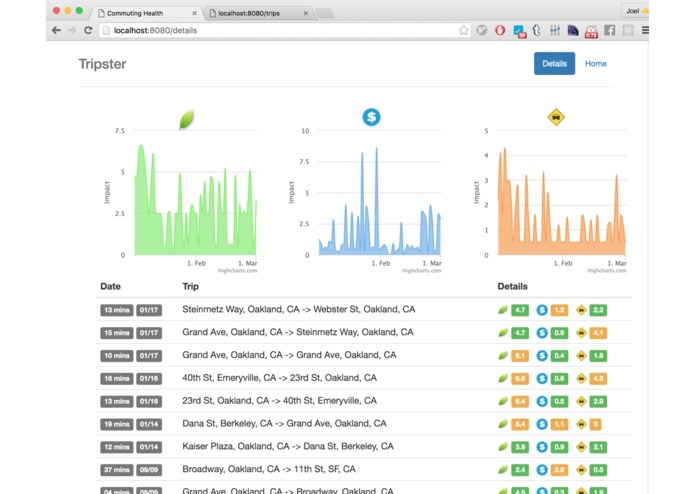 Tripster is a web app that uses historical data collected by automatic to evaluate your transportation impact over time. We’ve taken Jerry’s 600 trips and evaluated his impact on three dimensions: Environmental • How smoothly are you driving? • Could this trip be easily moved to more sustainable alternatives? Short trips could be moved to walking or biking. Compatible trips could be moved to transit. Safety • Are you performing emergency braking maneuvers? • Are you speeding? Money • How much are these trips costing you over time? Our app calculates your transportation impact across these dimensions, calculates your transportation impact and assigns a score. As a user, you want to reduce your transportation impact by reducing your scores. Technical Background Using R as the data analysis tool, our python program connects between the automatic api and our front end.